The Flash Star Gives Flashpoint Update, Is It Still Happening? Warner Bros. and DC dropped a bomb at San Diego Comic-Con, when they revealed that the new Flash movie will be Flashpoint. This was exciting for numerous reasons, but the most important was that we were actually seeing some movement for a Flash movie, since it had been in development hell for what seems like forever, searching for directors and scrapping scripts left and right. Another reason that the announcement was exciting was due to the fact that the Flashpoint story line is a time-twisting epic story that shakes up the foundation of all we thought we knew about our beloved DC characters. Now Ezra Miller has plans to call the DCEU the "DC Hyper-Extended Multiverse." In the Flashpoint comics, Flash goes back in time to try to save his mom but he wakes up in an alternate universe where he's just Barry Allen, lacking superpowers, and the world is very different. The Justice League and Superman seem to have never existed, Bruce Wayne was killed (and his parents survived) during a robbery, Thomas Wayne became Batman, and Martha Wayne went full Joker. The bizarre story helped shape DC into what it is today and fans have been really excited about the project hitting the big screen. 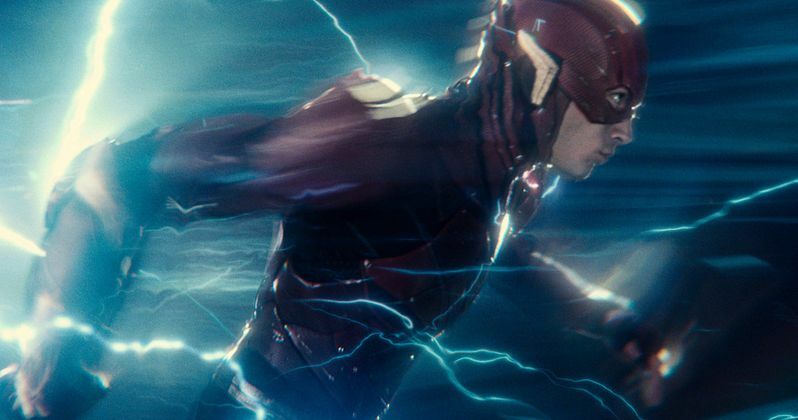 Ezra Miller is also very excited about the Flashpoint project and says that this particular stage of development is the best that the Flash has had thus far, which is really saying something. Miller had this to say while talking to Entertainment Weekly. "The development of the project has been a little Barry Allen-like in its mercurial tendencies. But it looks more promising and more exciting than any of the other stages of development that we've been in." Miller also went on to address just how crazy the story can be and that fans of the Flashpoint series don't even know what they're in for when the details are finally released about the movie. Ezra Miller also coined his own term when referring to the universe that the Flash project will take place. He explains. "What fans understand when they hear Flashpoint would be almost like hearing a word like 'Crisis.' We start to understand that our precious DC universe will inevitably be torn asunder to an endless, headache-inducing fabric of multiversality. The DC Hyper-Extended Multiverse, as I plan to call it. Quote me!" This "Hyper-Extended Multiverse" certainly sounds exciting and could be just what the DCEU needs to shake things up a bit. Geoff Johns recently said that the Flashpoint movie will cover new ground from what has been previously seen on screen. Johns had this to say. "There's elements in it that we're going to be playing into that we couldn't do anywhere else. The scale of it, the Batman story of it all." Jeffrey Dean Morgan has been rumored to play Batman in the Flashpoint movie since he plays Thomas Wayne in Batman v Superman and Ezra Miller is all for it. Miller had this to say about the possible involvement of Jeffrey Dean Morgan. "Oh, hell yeah. I think he's amazing, and I think he would fall right into what is becoming a very, very serious ensemble of actors. I'm so excited about Kiersey Clemons. I'm so excited about Billy Crudup. I just couldn't be more stoked about the names involved so far." Rumors have been going around that Warner Bros. is waiting to use the release of Justice League as a test to see if certain movies end up making it out of development and Flashpoint would fall under that "test." As far as early projections go, Justice League is expected to have a big opening weekend despite the bipolar reviews that the movie had received so far. Regardless, you can read more about what Ezra Miller had to say about the Flashpoint movie courtesy of Entertainment Weekly.